As the nation’s health care system evolves and its population ages, a collaborative focus on innovations in care is key to improving patient outcomes and containing costs, national leaders said at a conference in Los Angeles. In California alone, about $98 billion — or 42.4 percent of all health care expenditures — is spent on chronic conditions such as arthritis, asthma, cardiovascular disease, diabetes, cancer and depression. Those most at risk for poor health care outcomes include the underserved, the rapidly growing elderly population and the mentally ill. 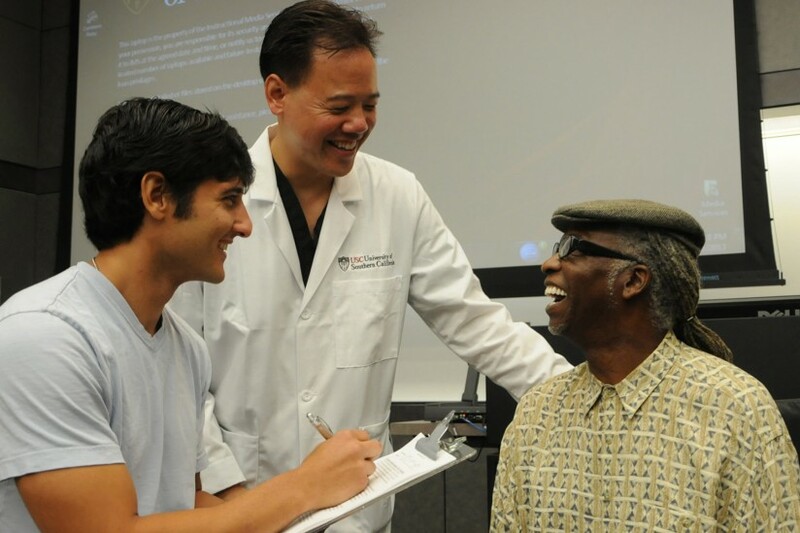 Yet pharmacists — who have the skills, training and expertise to ensure that patients receive the best treatments possible — are highly underutilized by health systems, said USC professor of clinical pharmacy Steven Chen, whose work in Los Angeles safety net clinics has become a national model replicated at clinics across the country. USC’s third annual Conference on Optimizing Medication Safety and Healthcare Quality brought together pharmacists, physicians, policy experts and health care leaders from across the country. Presented by the USC Schaeffer Center for Health Policy and Economics and the USC School of Pharmacy in collaboration with the Health Services Advisory Group, the conference aimed to build partnerships and share best practices for improving health outcomes while reducing total healthcare costs. Nearly 150 attended the event held at USC Feb. 11–12. Welcoming guests from the podium was Glen L. Stimmel, interim dean of the USC School of Pharmacy, who launched the conference with a message promoting collaboration as the best way to serve patients in today’s changing health care environment, particularly in public health, geriatrics and mental health. Overwhelmingly, the day’s presentations focused on the changing landscape of health care, and opportunities for increasing value in health care through interdisciplinary teams, with an emphasis on the role pharmacists play in managing medication use. Experts from across the country, including Hawaii, Montana, Arizona, North Carolina and Maryland, shared their experiences in safety net clinics, hospitals and community pharmacies. Attendees also looked at current approaches to helping patients manage their health, including face-to-face appointments and video telehealth consultations. Recognizing that pharmacists can help patients improve their health while saving precious health care dollars, USC School of Pharmacy clinical faculty, residents and students work in interdisciplinary teams in community settings throughout Southern California, with patients who are at a high risk for hospitalization and poor health outcomes. Thanks to a $12 million Center for Medicare and Medicaid Innovation grant, faculty from the USC Schaeffer Center and School of Pharmacy are able to measure the impact of comprehensive medication management on health outcomes and costs. “If you want to make an immediate impact on health care costs, health care quality and safety, chronic disease management for high-risk patients is key. It’s about collaborating with community partners, identifying patients in need and providing comprehensive medication management,” said Chen, who shared lessons for clinical pharmacy from the initiative. Data from the three-year program placing USC clinical pharmacy teams in AltaMed Health Services safety net clinics shows improved medication use and health outcomes, as well as greater patient/physician satisfaction and reduced costs through a marked reduction in readmissions. Keynote speaker Michael Metcalfe shared his personal story — one that went to the heart of the mission of the conference — as a former patient at the Center for Community Health, a safety net clinic on Los Angeles’ Skid Row. “Down there, I was just a statistic,” he said. At 301 pounds and down on his luck, he would eat two pizzas for dinner and drink liters of soda. Physicians had grown frustrated with his attitude and inaction. Then one day he woke up in a hospital, after spending eight days in a diabetic coma. It was Chen who helped him understand his condition, started him on insulin and taught him how to be consistent with his insulin injections while learning to eat more healthfully.